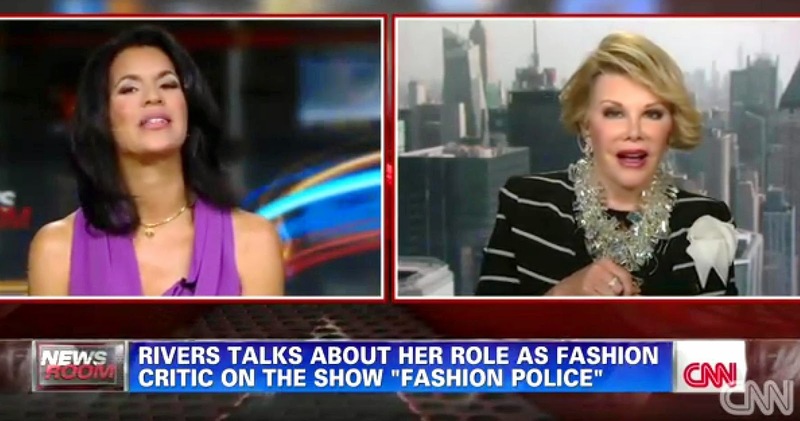 Dailybuzz.ch: Joan Rivers Storms Out of CNN Interview: "All You've Done Is Negative!" Joan Rivers Storms Out of CNN Interview: "All You've Done Is Negative!" During an interview with CNN's Fredericka Whitfield, comedian Joan Rivers, who is promoting her new book, Diary of A Mad Diva, stormed out, reacting to Whitfield's questions with "All you've done is negative!" The interview, which aired on Saturday, shows Whitfield asking Rivers questions about her wearing fur on the cover of her book, as well as her infamous criticizing of celebrity fashion on the red carpet. Animal rights activists had protested Rivers' book event at a Barnes & Noble last week. "I'm going, I'm really going. All you've done is negative. I've made people laugh for fifty years," she reacts to Whitfield aggressively. "My book is funny!" she then adds. Meanwhile, Whitfield looks bemused by Rivers' anger as the comedian pulls her earpiece out and walks off. But which ones? At the end of the segment, Whitfield does a follow-up where she claims that Rivers used several four-letter words when she had left the room.